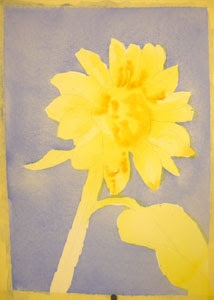 Today I am adding a very, very wet wash of Aureolin Yellow to the sunflower petals, seed head, and some of the leaves. I am going to leave the stem white for now. As the wash is very, drippy wet, I can play with it just a little, by dripping in some New Gamboge into some areas. This will create subtle little color plays in the underpainting which are not obvious in the final painting but add richness and volume. Using this wet-in-wet technique creates beautiful soft edges.